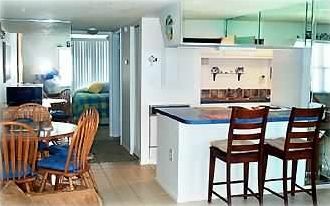 One bedroom, waterfront condominium on the Gulf of Mexico in quiet Sunset Beach. You are directly on the white sandy beaches at the Sunset Chateau. This Non-Smoking condo was remodeled and delights with a casual and simple Florida beach warmth. The condominium sleeps up to four with a pull out couch. Kitchen is furnished with colorful servingware and kitchen equipment. Two flat screen TVs keep you and the kids (or grandkids) happy. Free wi-fi is also available. Unit has beach chairs, towels as well as deck chairs for use while visiting. Cool off in the fresh water pool after a swim in the Gulf. You are minutes away from the commercial part of Treasure Island and St. Pete Beach with numerous indoor and outdoor activities to keep both adults and kids busy. We are Tampa residents who love the beach. One of the owners has been playing, swimming, snorkeling and diving in Florida beaches since she was five years old. This property sits on the fingerling island called Sunset Beach located in Treasure Island, FL. If you are looking for a quiet, peaceful respite for your base camp on the beach, but just minutes from all the fun tourist things Florida is know for; then this is the place for you. The most unique benefit of this unit/building is it's location on Sunset Beach. This is not an overcrowded beach and only building owners/tenants an use the pool and beach. The building sits directly on the beach; you are 30 steps to the ocean once you walk off the elevator. Directly on the ocean. The balcony looks directly at the ocean. Warm and inviting beach Condo on the beach. Nice, warm place. It’s not fuzzy and cold, but invites you into a nice Florida beach Condo. And the beach is below you, steps below you. This unit doesn’t deceive its place directly in the ocean. All amneties included. The Good: Very happy with the location on Sunset Beach! Aptly named as the sunsets were fabulous. Often it was a near-private beach with very little traffic, and its convenient to Treasure Island and St. Pete Beach. The room is generally well-equipped for beach and pool activities with chairs and noodles. We even added our beach umbrella to the collection for future guests. The AC worked great in the unit, and since we spent most of our time outside, and only did a little cooking, the room was adequate. Everyone we met was very friendly. We would go again, but maybe stay in a different unit because of the bed. Just OK: This is an older property and it shows, but it is maintained well enough. The denim slip-cover over the couch is neither attractive nor comfortable, but I understand why it's there. The screen on the front door doesn't close properly, but really, that was never a factor in our use or enjoyment. Be Advised: The bed is only a double bed and it is extremely firm --- it is not comfortable at all if you sleep on your side. Also, there is no private balcony, just the long, shared walkway in front of the room doors. So having our morning breakfast and coffee "on the balcony" was often interrupted by shifting to allow our neighbors to pass. Also, be aware that if the front drapes are open and there is any light inside, passersby can see into your unit. Not a big deal, but don't expect privacy with the blinds open to the balcony. Also, I wish our neighbors above were more considerate in the late evenings. The kids above us were running and jumping very loudly until near midnight many nights. We never saw who was in that unit during the day, but be aware that you may hear the wrestling matches above you. The place was very nice and clean, the owner was super accommodating and that is such a big plus when your traveling. They had plenty of beach towels and Bath Towels. The Queen size bed was comfortable (which is a priority for me) and the pull out couch and Futon were also comfortable which is really rare to get a comfy pull out couch. I would definitely recommend this unit and we do intend to stay there again. Thank you Miriam !! Thanks so much Sonia. We hope to see you again in the future. Peace. I am so impressed with this area and Miriam's condo and efforts. Let's start with the area. Well maintained, soft sand, 65 paces from the condo to the edge of the water. (Yes, I measured because most other buildings are a trek to the waters edge.) Well maintained, not crowded, almost like having a private beach. The area is a $5.00 tip ride to anywhere using the Free Beach Transport or use an $8.00 Uber. Close to a fantastic Mexican american restaurant that I highly recommend (VIP) and many other places to eat and drink. Free parking, wifi, TV in the living room and bedroom. Umbrella, cooler, beach chairs, noodles. Everything you need for fun and protection on the beach. Miriam is extremely responsive and easy to contact. The kitchen is fully equipped. Oh and did I mention the comfortable queen bed and the quiet air conditioner. Believe it or not this was very important to me. I have no downsides to share. The condo is a little older but in perfect condition. It was plenty of room for myself and my husband. Lovely sized walk in shower with plenty of towels. I truly recommend this rental and property for anyone looking for a resort feel/city holiday. The condo was spotless. It had a well furnished kitchen, although it did not have a lot of staple condiments that other condos supplied, such as spices, sugar, oil. The bed was very comfortable. The bathroom was very clean, and the bath towels were extremely soft. There is a good supply of beach chairs and other items for beach fun. There is a key within the lockbox. Internet service worked well. I was able to stream on my computer with few problems. My contact for the condo, Miriam, was very responsive to my emails and very helpful. I hope to be able to stay there again. We loved being on the beach (Note- the beach is very shelly- bring water shoes. ) The condo was just as described. It’s a bit older and small for 5, but we knew that going in. The pool is great except there’s no furniture. It’s very strange. We borrowed her small beach chairs but it’s not the same as full lounge chairs. We visited Ft DeSoto and loved it. Our family had a great time. This property is on Sunset Beach. It is the fingerling island in Treasure Island. It's 5 minutes from St. Pete Beach and ten minutes from St. Petersburg shops/Dali Museum and Madeira Beach and the famous John's Pass Village and Boardwalk. $100 fee added for stays that include major holidays: New Year's Day, Easter, Memorial Day, 4th of July, Labor Day, Thanksgiving, Christmas.